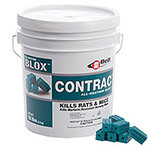 The level of rodent activity determines the appropriate rodent bait for the job. Do you have a heavy rodent infestation or light rodent infestation? Is the rodent activity persistant and ongoing? Do you want a rodent bait for monitoring purposes only? We will be glad to assist you in rodent bait selection and application for sucess in any rodent control program. Types of Baits : Single Feed or Multiple Feed Baits. Single feed baits work faster than multiple feed baits. Soft Forms: Non-weatherproof, outstanding acceptability by rodents (even with other food sources close by). Sewer and Burrow Baiting: See individual product labels for restrictions or give us a call. Rodent Baits are food based baits or liquid baits. In situations where water is scarce, liquid baits work well. The food based baits have grain or seeds mixed in their formulations to attract the rodents. They come in blocks, pellets, meal, and soft bait forms. 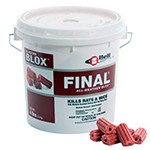 Block baits use the food industry's technology of extrustion, such as used for dry dog food. They provide attractive gnawing surfaces for rodents. They are the most versatile; effective in moist or dry conditions. Most block baits have center hole to accommodate a wire or rods in the baits stations to keep them secure. This method of placing the block baits on a rod provides addtiional protection because the bait can't be stolen by the rodent and moved outside the station. 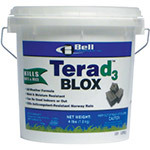 Using bait blocks have become standard practice in commercial facilities. Pelleted baits come in bulk in buckets or place packs. The place packs hold up in moisture conditions. Pellets resemble a food particle, which the rodent readily picks up. The draw back with pelleted baits, is they may be carried off and hoarded in areas where you do not want bait. Meal baits don't get carried off like the pelleted forms, but are susceptible to moisture. They can spoil quickly in humid or damp conditions. They come in bulk containers and meal place packs. Soft Baits are packet-style baits that are soft. Soft bait baits have increasingly become one of the better forms for superior bait acceptance. Anticoagulants are divided into first generation and second generation anticoagulant baits. The first generation anticoagulants require multiple feedings (multiple-dose) for a lethal dosage, and the second generation anticoagulants (single-dose) require only one feeding for a lethal dosage. Death is delayed with anticoagulants as it disrupts the normal blood-clotting and causes internal bleeding. Even though the death is delayed, it is not painful. The rodents do not associate the anticoagulant with death., so they do not develop bait shyness. The treatment protocol for accidental poisoning is Vitamin K, which is readily available by vets. We always recommend the use of resistant proof bait stations when using rodent baits.Currently, second generation anticoagulant baits can only be sold in 16 lbs or more per EPA. Second Generation Anticoagulants-These types of rodent baits are our first recommendations, due to their great bait acceptance. They kill rats and mice that are resistant to first generation rodent baits. Common active ingredients available in the USA are bromadiolone, brodifacoum, and difethialone. Rodent baits with these ingredients kill with very little bait consumed. These baits are beneficial for heavy infestations and where there is a high food competition. These baits also are used where there is persistent rodent infestation, and may also be used for occasional invaders. First Generation Anticoagulants-These are multiple-dose rodent baits. Rodents need several feedings (over 3-10 days and more for mice control) to be effective. These baits must be available continuously until all the rodents stop feeding (this may take 2-3 weeks). These baits have a lower risk for non-targeted animals, since multiple feedings are required. These baits are best for maintenance situations. These baits may be sold in any weight containers. Manner of death varies with non-anticoagulants. Some act as a nerve poison, and other types depletes the calcium from the bones, resulting in death. The ones that we carry are single-dose, with just one dose for a lethal dosage. It is important to use resistant bait stations, because there is no effective antidote if accidental ingestion occurs. You have less of a chance of secondary poisoning with non-anticoagulants as opposed to second geneation anticoagulants. Antidotes: There is no direct antidote, however there are treatment programs for sub-lethal ingestions. 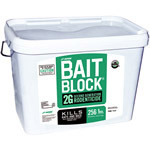 These class of rodent bait have the greatest bait acceptance and effective results. These baits are ideal in infested areas.They are beneficial for heavy infestations where there is strong food competion.They are used to control persistent rodent infestations. Rodents must consume multiple feedings of this rodent bait for the anticoagulant to be effective. Diaphacinone is a lower risk for non-targets (children and pets) because multiple feedings need to take place for the bait to be considered harmful. 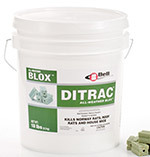 Generally more Ditrac or Liqua Tox rodent bait needs to be consumed to reach a toxic dose. Treatment Protocol: There is no direct antidote, however there are treatment programs for sub-lethal ingestions. Care should be taken to use tamper-resistant bait staitions. Tier 1 certification require stingent testing for this classification. Tier 1 Stations such as Protecta LP, Protecta Evo Ambush Stationsare recommended. Bait quantity of non-anticoagulants may be about one-third that used with anticoagulants, since an animal ingesting a toxic dose does not feed again. After one dose, rodents will typically stop feeding on non-anticoagulants baits because the acute active depletes them of their energy which is required to search for or consume food. Antidote: There is no direct antidote, however there are treatment programs for sub-lethal ingestions.